SUPERTUBOS, Peniche/Portugal (Thursday, October 19, 2016) – Following an exciting conclusion to the recent event in France, the world’s best surfers have now arrived in Portugal for Stop No. 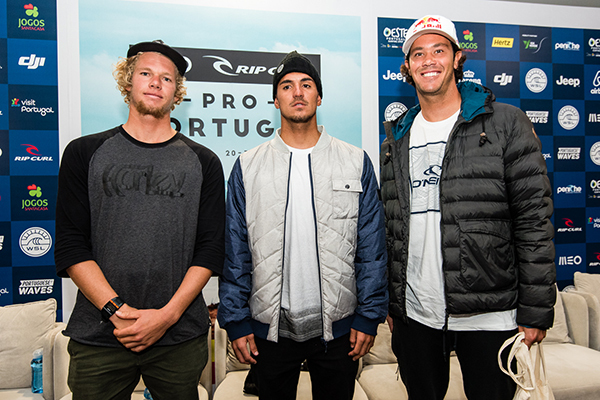 10 on the World Surf League (WSL) Championship Tour (CT), the MEO Rip Curl Pro Portugal. The event holds a competitive window starting Friday, October 20th, 2017 and running through October 31st, 2017. Held at the world-class beach break of Supertubos, the MEO Rip Curl Pro Portugal has hosted the world’s best surfers since 2009. With just two events remaining this season, the event will once again be a crucial stop in the hunt for this year’s world surfing crown as well as the battle for requalification. The title race is wide open with eight WSL Title contenders going into Portugal: John John Florence (HAW), Jordy Smith (ZAF), Gabriel Medina (BRA), Owen Wright (AUS), Matt Wilkinson (AUS), Julian Wilson (AUS), Filipe Toledo (BRA) and Adriano de Souza (BRA). If Florence finishes 3rd or below, the World Title decision will go to Hawaii. Smith wore the yellow jersey until a disappointing Round 3 exit in France saw Florence overtake him on the Jeep Leaderboard and claim the jersey for himself. The South African has a strong record at the event, with a Semifinal finish last year and a runner-up finish in 2014. Medina is fresh from a victory at Stop No. 9 on the CT in France and now sits in third place on the Jeep Leaderboard as a serious title contender. The 2014 WSL Champion is carrying a 25th place finish in his ranking points total so will need to improve on last year’s Round 3 elimination in Portugal in order to keep his title hopes alive. Frederico Morais (PRT) leads the 2017 WSL Rookie of the Year race sitting two spots above his closest rival in 13th place on the Jeep Leaderboard. The local hero reached the Quarterfinals in 2015 as a wildcard and is sure to be a crowd favorite at the event. Vasco Ribeiro (PRT) and Mason Ho (HAW) have been confirmed as event wildcards. Riberio, who made the Semifinals at the event in 2015, will match-up against Smith and Italo Ferreira (BRA) in Round 1 Heat 5 while Ho will take on Florence and Kanoa Igarashi (USA) in Heat 6. “I’m so happy to have the wildcard this year,” said Ribeiro. “Two years ago here was a great year for me at this event and the wildcards I’ve had really gave me a great experience. The forecast looks good so I’m really excited. This is a big opportunity and a big experience for me and I hope everything turns out okay. Good luck to everyone in the world title race.”Kelly Slater (USA) will not compete during the event due to his ongoing recovery. WSL Replacement surfer Nat Young (USA) will surf in his place. Solid swell to kick off the opening days of the contest with the weekend offering the best combination of size and conditions at Supertubos. Smaller surf is due Monday ahead of long period WNW/NW swell that fills in on Tuesday (24th) and peaks Wednesday (25th) before easing over the second half of next week. More swell possible towards the back portion of the contest waiting period. Event organizers will convene at 7:45 a.m. (local time) tomorrow to assess conditions and make the first call. The events will be broadcast LIVE via WorldSurfLeague.com, the WSL app and on Facebook LIVE via the WSL’s Facebook page. Also check local listings for coverage on CBS Sports Network in the U.S., Fox Sports in Australia, ESPN in Brazil, Sky NZ in New Zealand, SFR Sports in France and Portugal,Sport TV in Portugal and the EDGEsport Network. ALL RIGHTS NOT SPECIFICALLY PROVIDED ABOVE ARE RESERVED BY WORLD SURF LEAGUE. This entry was posted in Adventure, Events, Global News, Highlights, Surf, Water by admin. Bookmark the permalink.